Watch as A&M tackle the key technique to this week's spring vegetable winner: Shaved Asparagus and Mint Salad. Tedious? A tad -- but less so (we promise!) if you watch this video. This week's video was once again shot and edited by filmmaker Elena Parker. I use a mandolin to shave asparagus and it's reasonably effective. 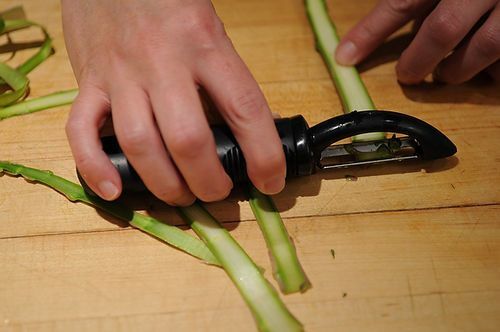 Thanks for demonstrating the peeler method! Thanks for that! I too had never heard of shaving asparagus and will look forward to making your salad. I love watching you two in the kitchen and am loving shaved asparagus this season. So fresh! I leave the ends on for a handle and begin shaving where the color deepens. Could you cut the spears in half and then use a mandoline to slice them? I have never heard of shaved asparagus and I'm completely intrigued. I have some fresh spears just waiting in the fridge to be prepared within the next couple of days - so this recipe is a must. Thanks for the tip! I shave them all the time into all of my green salads. Just adds a dimension to the salad and often people will not recognize the flavour right away. I love those shaved pieces of asparagus - so beautiful. I might try this soon since my daughter is a major fan of asparagus - she'd probably like the different texture for a change.